This clock was ticking and tocking when many roads were still dirt, folks got around on horseback and gas lights illuminated walkways and streets. Its hour and minute hands rotated throughout World Wars I and II and into a new century. Now, this heirloom of the family that owns Hardy’s Jewellers keeps time in the digital age – and from a new location. 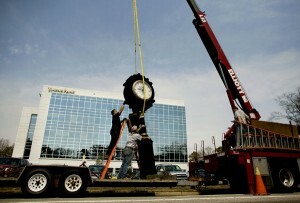 A crew moved the outdoor clock on Wednesday from the old Hardy’s in the Wayside Village Shoppes on Virginia Beach Boulevard to its new home at TowneBank Pavilion Center II off 21st Street. “It never occurred to me to leave the clock behind because it would be like leaving my grandfather standing there,” said Elizabeth Hardy, who has managed the business since 1993. The clock was commissioned in 1884 by Daniel Buchanan, Hardy’s great-great grandfather. The iron pedestal, still the original, is 13 feet tall. The clock itself has undergone several makeovers and is now designed to look like the original. The clock head is likely made of porcelain over steel. The face has a radius of about 30 inches. From 1885 to 1907, it stood in front of the D. Buchanan and Son jewelry store on Broad Street in Richmond, after Buchanan emigrated from Scotland. The clock moved to Norfolk in 1907, when the family opened a new store. It survived the big fire in 1918 at the Monticello Hotel at City Hall Avenue and Granby Street. It was positioned in front of various Norfolk store locations along Granby for 70 years before going into storage, then again put on display in 1979 at the Virginia Beach Boulevard store. A clockmaker from Boston, Edward Howard, designed the clock, which was originally operated with a hand crank but began being powered by electricity in 1933. 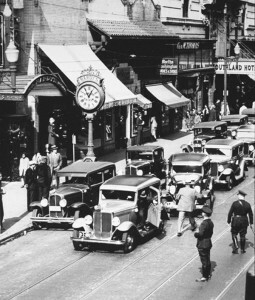 This photo of Hardy's clock was taken around 1928 on Granby Street in Norfolk. The clock weighs about 650 pounds, so moving it required some expertise and muscle. Artlite Signs & Awnings bolted the clock to a trailer. Once it arrived at its new home, the clock and its base were raised gingerly to stand upright. 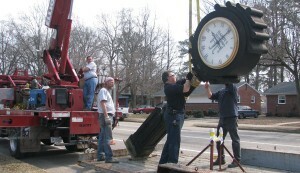 The movers picked a secure point near the top of the pedestal to pick up the clock, said Artlite co-owner Mark Shively. Hardy said she was overwhelmed when she saw the clock in its new spot. Motorists heading to the Oceanfront will pass it after Interstate 264 east becomes 21st Street. “I think I’ve done the right thing,” she said.